A couple days ago, while sitting with the illustrious Duncan Mackenzie, Richard Holland, and Claudine Ise, recording some musings on Chicago art at a bar in the middle of the afternoon, we started to talk about the tradition of socially engaged art in Chicago. I talk about this a lot, especially trying to figure out how to explain it to my students at University of Illinois at Chicago, where I co-teach a class introducing the subject with my colleague Faheem Majeed. I’ve been thinking lately about how to distinguish, at least for myself personally, what I think is good or bad or boring or exciting or challenging socially engaged art, a very murky field. When judging that kind of work, as I’ve talked about previously on this blog, what interests me is that socially engaged art struggles to address the world outside the world of art. And with that comes a struggle for the artist to engage not only in what kind of artist they want to be in the world, but also what kind of person they want to be. Thus presents a complicated dilemma, because oftentimes it feels like to judge this kind of work also always includes a judgment on how ethical we perceive the artist as a person to be. And so trying to avoid the trap of deciding who I think is the best person or the most righteous (because really, socially engaged art should have the license to upend our perceptions and not always make the world a better place), I’ve been leaning towards the idea of compasses as a way of getting me somewhere out of the quagmire. I mean compass as a sort of aspirational mechanism, wherein a constellation of people, projects, and places provide for me a navigational tool for a world off in the distance that I want to get to. Like for instance, Laurie Jo Reynolds is a compass, because she along with tons of other people spent years trying to close Tamms Supermax prison, and they did it and that is completely amazing. And the beautiful process by which that came to be drew on a set of aesthetic strategies that made it art, not only because it was creative activism, but because it also created a space for speculation, for not-knowing, for metaphor and poetry. Tamms Year Ten is a readily available example because of all that was accomplished, but there are a host of others operating at different scales, both historically and today. And other folks, who shall remain nameless, are just not creating a world I want to be part of because they donâ€™t think about the aesthetic experience or they have lazy politics or the artist thinks its about the social world, but by that they just mean the art world, because its all they really think about. Iâ€™m working on articulating this, but itâ€™s a start. And when I start thinking about compasses, I believe Iâ€™m also speaking of narrative. The process by which we encounter the world as it is and speak of how to transform it is a space of art, but capturing that process is a difficult thing. It cannot often be brought to life after the fact without a good story attached. 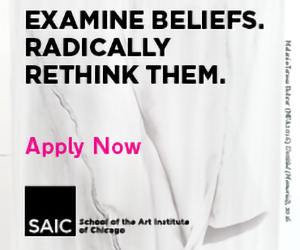 This last Monday, Julie Ault came to speak at SAIC, mostly about a creative archiving practice that spans the last 32 years. 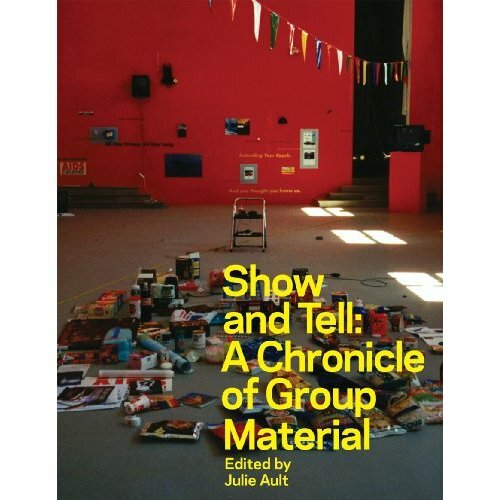 In 2010, her edited version of Group Materialâ€™s seventeen year history (of which she was a founding member) came out in the form of Show and Tell: A Chronicle of Group Material. In the text, sheâ€™s found a way to create a compelling portrait of a long and complex collaborative process, rather than a theorized history, zoomed out from above. Documentation of their projects is interwoven with minutes of meetings, polemics, ranting about collaboration, internal disagreements; all of this to assert the primacy of their voices and a ground level vantage point, situating readers in the time of the projects. A micro-culture gets revealed and what we theorize with a backward view to context and circumstance gets complicated by interjections and digressions that resist a single vantage point. The story is the complexity of collaboration, the struggle with institutional legitimation and the exploration of artistic forms, most notably in their practice of exhibition-making as a kind of artwork. The multiple viewpoints, the many different takes on a situation, the resistance to one kind of narration, is the struggle to how to understand participatory, socially engaged work. 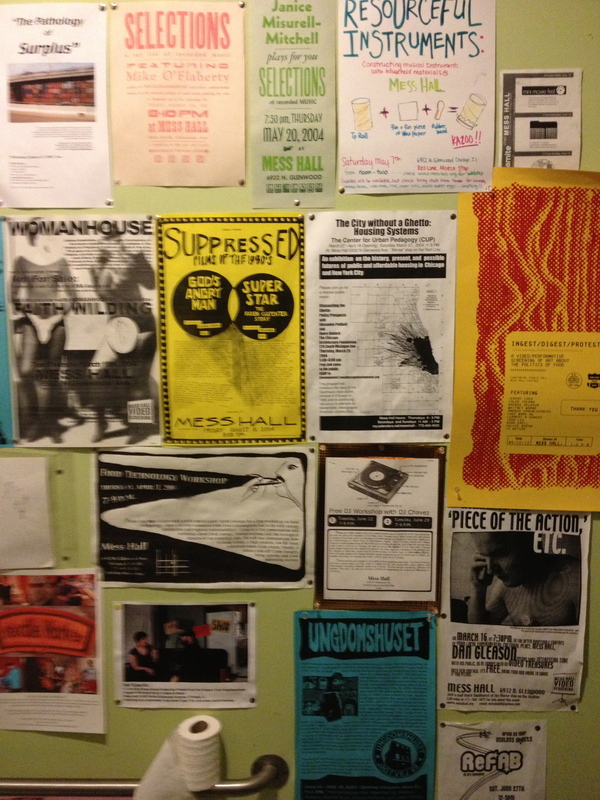 What this brings to mind, in this riff on orientation and documentation and archiving, is the fact that Mess Hall will close on March 31 after a ten year run. Mess Hall formed in 2003 when a landlord in Chicago was prompted to supply a storefront in the Rogers Park neighborhood free of charge after reading an article in the New York Times mentioning Chicago-based Temporary Services. Thus began a space for “visual art, radical politics, creative urban planning, and applied ecological design” in which no money was allowed to change hands. Its many keyholders have hosted a local and international socially engaged creative community as well as potlucks, free stores and seminars on participatory budgeting with the district’s Alderman. It was a welcoming-and-kooky-and-homey-and-sometimes-dogmatic-but-mostly-not-and really-just-all-over-the-place space. I remember in 2008, when this amazing weekend symposium happened called “What we know of our past, what we demand of our future,” organized by Brett Bloom and Bonnie Fortune, where a group I am involved with, InCUBATE, was invited to stage our project Sunday Soup, which involved selling soup for money that would go towards a creative project grant. But since the rules of no money changing hands was so strict, we had to sell our soup out on the sidewalk and it was January so, obviously, absolutely freezing to be out there. I also met Nato Thompson that weekend, which led to me working for a summer at Creative Time, and we ended up hosting Sunday Soup at the exhibition Democracy in America with Robin Hewlett and Material ExchangeÂ and meeting tons of people which in many ways spurred the Sunday Soup network on its way. Last Saturday I went to one of their closing events, The Material Production of Cultural Spaces, which featured speakers on â€œexploring practical models for building counter-institutions that are non-commercial, consensual and community driven. 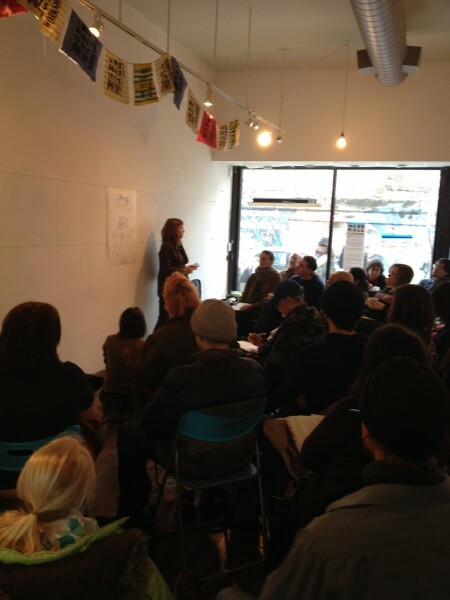 Guest speakers will offer concise presentations on the labor, tactics, skills and monetary investments required to forge/forage alternative cultural spaces in Chicago.â€ One of those speakers was Sara Black, narrating the experience of the now defunct Backstory CafÃ© and Social Center in Hyde Park. And she spoke of Backstory much in the same way as these projects Iâ€™ve mentioned: complicated, messy, beautiful collaborations, speculative at the same time as concerned with real world applications. (Robin Hewlett speaks of this as well in her essay â€œSmall Business as an Artistic Medium.â€)I went there frequently, I was close with the organizers, and hearing something that youâ€™ve lived through (even vicariously) spoken of through a narrative creates a jarring nostalgia and Iâ€™m sure brings up complicated memories for all that were involved. But the only way to really hear and feel and understand what was important about that place is through listening to its story, because you cannot have the affective experience of standing in that place, with those people, at that time. I often feel this sort of inside/outside dilemma of narration and storytelling when explaining some of my own experiences like closing the InCUBATE storefront in 2010. The more I tell that story, the more it is told using the same words and the same pictures, which feels a little sad but I know Iâ€™m lucky that people actually care about it too. Ault talked about this as well, that for a long time she and Doug Ashford (another founding member) thought that the best way to keep Group Materialâ€™s voice present was to narrate the experience in person rather than through a set text. I imagine that archiving oneâ€™s own experience is overwhelming, grappling with a long, formative, contentious group history that doesn’t want to go silently into the archive. I really am going to miss Mess Hall. I say that with unabashed sentimentality. It will remain a compass for me because of its messiness, its utopian promise, its desire to be so wholly other than the typical art institution and outside the market, and because its sweet belief that social and economic justice could exist coterminously with a desire to be an ethical, socially-engaged culture-maker. 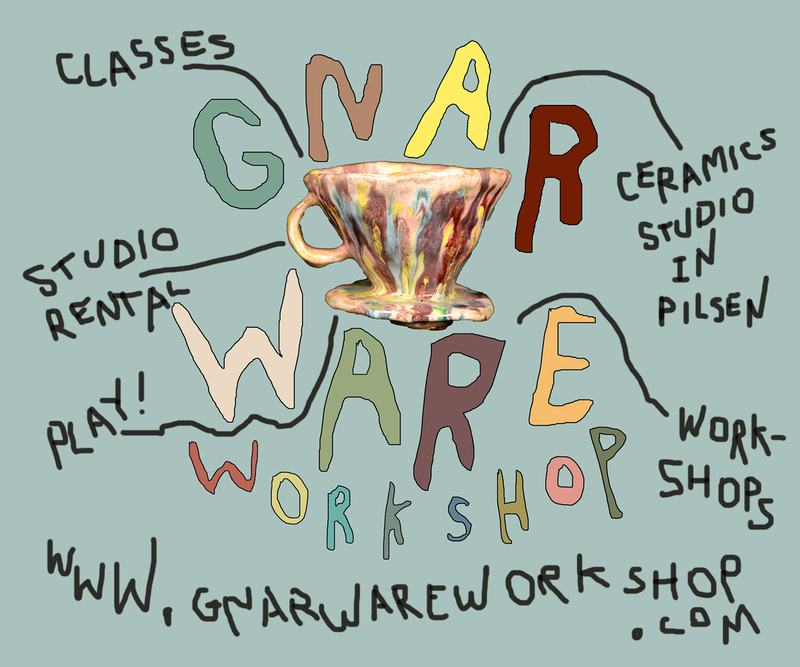 Go see them before they close, the final party is on Friday, March 29. As they say: Join us for our final gathering in the space. We will say our farewells with a parade, a key-tossing ceremony and a night-long party. The current key-holders do not wish to leave the space alone. We will leave it as we found it: together. PS: Never the Same is doing a free seminar this summer on archiving Chicago’s politically and socially engaged history, their call for participation is here! Introducing Bad at Sports’ Newest Bloggers!